Slightly damaged earthing mat with cover and EU connection set. With a € 15 discount! Only for existing customers The EU earthing plug is a specially designed plastic plug with two metal strips for in a grounded outlet to connect an Earthing product. 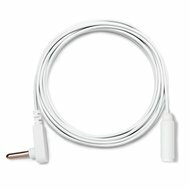 The extension cord of 3m is a thin white cable, which can be used to lengthen any other Earthing cable or Earthing cord. 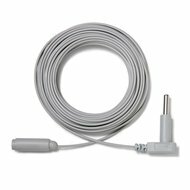 Extension cable 10m, (for earthin..
Extension cable 10m is a thin white cable, which can only be used to extend a connection cable of an earthing undersheet (with 50% silver) or a wrapping tape. The extension cord of 12m is a thin gray cable, which can be used to lengthen any other Earthing cable or Earthing cord. Connection cable 4,5m is is suitable to connect a grounding mat, Grounded Beauty grounding product, (mini) throw or a first generation earthing sheet. 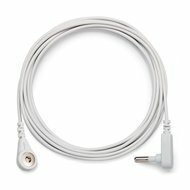 Connection cable 5m, only suitable for a silver undersheet or an earthing wrapping band. The earthing cable 5.5m is a coiling cord (coiled like a cord from a telephone landline) which can be connected to all Earthing products. The earthing cable 6m is a coiling cord (coiled like a cord from a telephone landline) which can only be connected to all silver undersheets and Earthing wrapping bands. 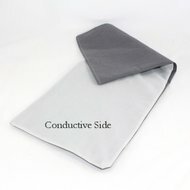 The cover for the universal Earthing mat is made of cotton with conductive silver thread and a grey, non conductive, fabric on the other side, the bottom. 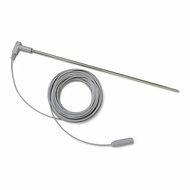 Earthing plant rod 30cm with 3m c..